Fresh Banana fruit food pictures, photos, images. 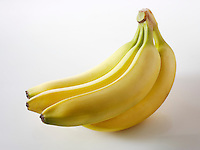 Banana is the common name for herbaceous plants of the genus Musa and for the fruit they produce. 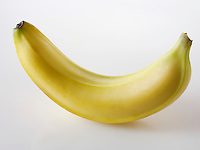 Bananas come in a variety of sizes and colors when ripe, including yellow, purple, and red. 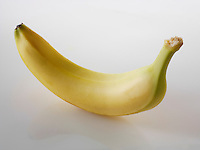 In popular culture and commerce, "banana" usually refers to soft, sweet "dessert" bananas. By contrast, Musa cultivars with firmer, starchier fruit are called plantains. 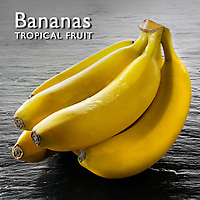 Many varieties of bananas are perennial. Refer to the Musa article for a list of the varieties of bananas and plantains. They are native to tropical Southeast Asia, and are likely to have been first domesticated in Papua New Guinea. Today, they are cultivated throughout the tropics. They are grown in at least 107 countries, primarily for their fruit, and to a lesser extent to make fiber, banana wine and as ornamental plants. 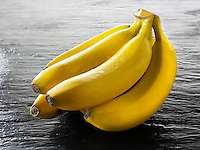 Bananas are naturally slightly radioactive, more so than most other fruits, because of their high potassium content, and the small amounts of the isotope potassium-40 found in naturally occurring potassium. Proponents of nuclear power sometimes refer to the banana equivalent dose of radiation to support their arguments. 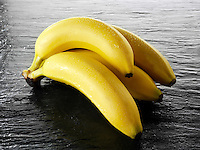 Banana shipments often set off the radiation monitors installed at US ports to detect illegal shipments of radiologic materials.